The unusual can be of great interest, especially in a sea of conformity. Today's review revolves around a winery in Bel Air, yes, that Bel Air of Fresh Prince fame. Who knew, that with the boundaries of a sprawling urban metropolis there was a paradise where the heart of Bordeaux grapes beats. I'm sure to this day, many of their neighbors look out their triple paned tinted windows and seeing vineyard, it has to be an 'unusual' but now welcomed sight. Unlike many of the 'celebrity' wines populating store shelves, enticed by the romance of vineyard ownership, I've tasted over the years and sneered at, but these wines from MBA are produced in a Bordeaux style, showing real soul and substance. In the go-go eighties, the vineyard started to come into fruition, consultants were hired, and Cabernet Sauvignon, Merlot, and Cabernet Franc were planted with much success. The original Sauvignon Blanc perished but was later replanted, along with some Petit Verdot and are thriving today on disease-resistant rootstock. 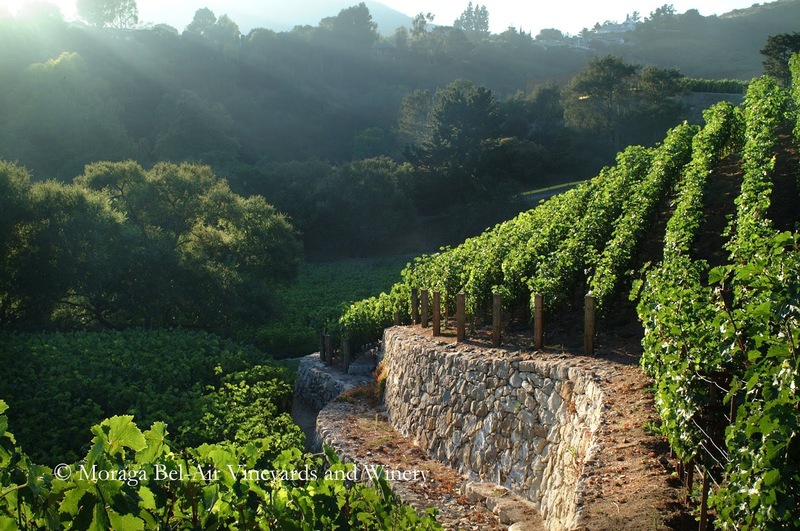 Twenty-four successful vintages later, Mr. Jones sold the property to media-titan Robert Murdoch, who plans to continue the Moraga Bel Air legacy. Today, there is a fully functioning crush pad, a wine cave for natural barrel aging, cut into the hillside and seven acres planted to Bordeaux varietals on American rootstock, producing world-class wines worthy of the well-heeled collector looking to fill their cellar with new ideas of exhilaration. 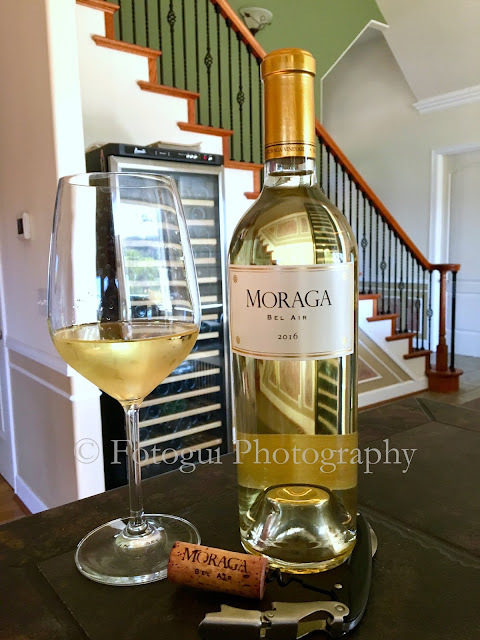 From this small microclimate, Moraga Bel Air carved out a niche for growing vines in marine sedimentary, shale soils with a view of the ocean, great care is taken in the vineyard, practices putting them on a clear path of sustainability. The row spacing is so tight that it has to be completely hand picked and maintained during the growing season. They (MBA) produce roughly ten thousand cases of Red and White wines, with the majority of that being their signature red blend. 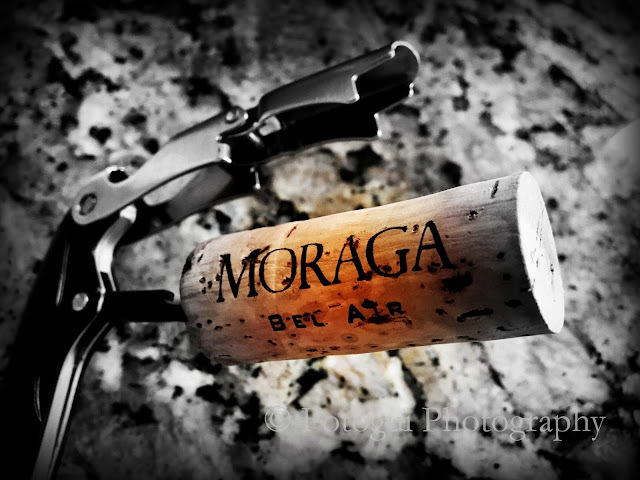 Moraga Bel-Air Red Blend 2014: You won't be disappointed, definitely well-built, robust wine that is drinking nicely now, but is built to age many more years. For some the price of the wine most likely knocks it out of the "everyday" drinker category; however, you don't want to miss grabbing some bottles and storing them as a weekend wine, to give as a gift or mark a special occasion. In the glass, was medium in appearance, having good depth and intensity of color. The core was a dark ruby to purple in color, near opaque, while the legs were reflecting the depth of color. On the nose this wine had a clean, pronounced nose, brimming with dusty mocha, cigar box, crushed peppercorns, flamboyant plum, and currants. Btw, the corks chosen for these wines, wow, they cost some serious coin, about a half inch longer than most, and a bigger circumference, signaling this is age worthing juice, be patient. On the palate, the acidity keeps the rather plush fruit inline and well-integrated tannins play bass in the background, gently aged on French Oak. Other appealing flavors of, ripe fig and cherries swirling about to a lithe but long, sumptuous finish, plush elegance all around. Sadly, there are no tech sheets available, I guess it's a proprietary issue. So yes, it's a blend of four different grapes, I have to speculate as to the possible percentages, so here it goes, 78% Cabernet Sauvignon leading the pack, followed by 18% Merlot, 3% Cabernet Franc, and a drop Petit Verdot. My score for this wine, 92 points. Pairing partner suggestion, a fat aged ribeye or the paupers choice a dry-rubbed Tri-Tip. Moraga Bel-Air Blanc 2016: Today I'm recommending a domestically produced Sauvignon-Blanc to each and every one of you. As many of you who have been long-time readers understand, I'm not typically a fan of domestically produced Sauvignon Blanc. Why, well because to me most of these wines are predictably oh-so-similar, with the usual suspect of flavors and aromas. The boat-loads of grapefruit, cut grass (freshly mowed) high-pitched citrus tone, uber enamel eroding high acid and other aggressive off-putting flavors are a non-starter for me. Market wise, that described style is appealing to many, but not me. Glad to say there's none of 'that' associated with this Sauvignon Blanc. Here’s what I found so appealing about this wine, the MBA SB, it’s approachable right away, dressed to impress, no fuss, no muss, just put a bit of a chill on it and wow you have a masterpiece of lingering Sauvignon Blanc decadence. Again working on this note without a tech-sheet. So, I'm just guessing, but I'm sure it's a safe bet that all the rough edges have been gently sanded down via a small 5% of the wine, which was fermented and aged in neutral French Oak.